Snap-On Smile® is a patented, easy and painless way to obtain a beautiful smile. You can eat and drink with your Snap-On Smile. It’s easy to care for and can be a temporary or permanent cosmetic solution. It’s available for upper and lower teeth. Some patients can cover only upper or lower teeth, while others need both upper AND lower covered for best results. Snap-On Smile’s unique, proprietary formula of hi-tech dental resin makes it very thin yet extremely strong. It fits right over your own teeth to give you a beautiful, natural looking smile—even if you have stains, chips, gaps or missing teeth. 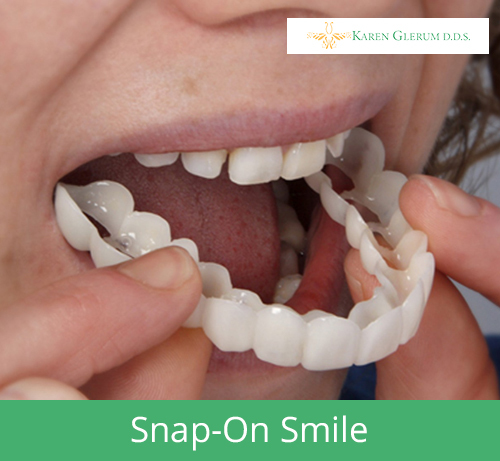 And for many people, Snap-On Smile can be life-changing. It gives back the confidence to smile. While Snap-On-Smile does NOT fix any dental problems you have, it can provide a “quick fix” for those who need a transitional smile or a temporary cover-up. You come back in about three weeks for a final fitting and you wear your Snap-On Smile home!